Sign up | Forgot Password/Policy #? Milestone: Speeding Insurance proudly welcomes its 57,000,000th policy owner into its fold. Speeding Insurance© introduces internet-subscription capabilities for purchasing speeding insurance. Speeding Insurance© offers new rates for age demographic of 21-40. Speeding Insurance© is an insurance policy you can hold today to protect you against speeding penalties you may incure. Who hasn't been driving along the interstate with the music playing and/or had their mind wander slightly? Before you even realize it, you're going 5...7...even 10 miles-per-hour over the posted speed limit! Maybe you catch yourself, maybe you don't. However, it's in those moments when you could find yourself with the red, white, & blue flashing lights behind you. More than likely you'll end up with a steep fine for your neglegence. However, now there's speeding insurance! INSURANCE CAN COVER THE FINANCIAL COST OF YOUR SPEEDING TICKETS! For an inexpensive monthly premium you can now have peace of mind that your mindless and accidental slip-ups won't cost you your hard-earned money. The claims and statements made above are based upon our specified terms of agreement. Terms and Conditions | FAQ | Rates | Sign up! 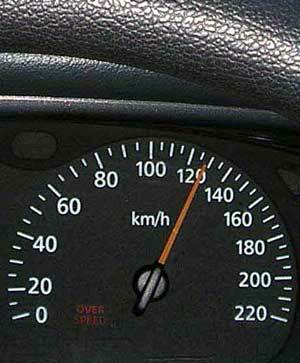 Speeding Insurance© does NOT Encourage Recklessness!! We want to get this point front and center. Furthermore, we stipulate that neither Speeding Insurance©, its employees, subsideraries, or any of its affiliates approve of breaking the law--federally or at a state level. Speeding is both reckless and dangerous. Speeding Insurance© strongly adheres to the dogma that at all times persons should respect and obey any and all state and federal laws, including staying within the posted speed limits. Knowingly breaking any state or federal law, for any reason, is illegal and not condoned in any way by Speeding Insurance©. With that being said, The Speeding Insurance© Policy is stictly for the purpose of mitigating the speeding fees brought upon by ACCIDENTAL (and transitory) traveling thoughtlessness. Speeding Insurance© understands that minor speeding violations are the number one ACCIDENTAL crime. It is for this reason alone that Speeding Insurance© exists and is here to help. Speeding Insurance© does NOT promote, encourage, support, or condone driver recklessness! It is for this reason we do not cover in our policy fees incured where the policy holder is in violation of our terms and conditions. More information can be found on our frequently asked questions page. Terms and Conditions | FAQ | Rates | Comments / Feedback | Sign up! Copyright © 2019 Speeding Insurance©. All Rights Reserved. Sign up! | FAQ | Terms & Conditions | Comments / Feedback | This is not a real website. The domain www.speedinginsurance.com is for sale. This faux website is in place for the exclusive purpose of generating SEO relavence, which will benefit the eventual owner. Extra $250 for sample website and demo web application. Note: Site depicted above is not a real application; it is for demo purposes only. It is not hooked up to any payment processor or online payment system for receiving payments of any kind. It also is not licensed in any way, shape, or form by any state or federal agency for selling insurance or providing services of any kind. Such a service/application in the future must go through necessary/legal proceedings for obtaining any/all applicable licenses for selling insurance. This "sample app" is merely an example framework of what such an application may look like, should it be made into a viable and legal business by a company, person, or entity.